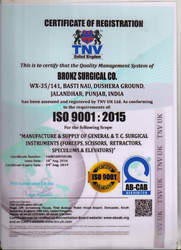 Founded in the year 2007, Bronz Surgical Company is one of the reputed companies engaged in Manufacturing, Exporting, Importing and Trading of Surgery Instruments, Hospital Holloware, Neurosurgical Scissors, Neurosurgical Needle Holder and Neurosurgical Tying Forceps. Our qualitative range of products includes Vannas, Vanna's Micro Scissors, and Jacobson. We are into the business of manufacturing wide range of surgical instruments that are widely used in various hospitals, nursing homes, health care centres and other medical establishments. Our range is appreciated across the market for the features of easy to handle and use, absolutely safe, noise free treatment and portable. Our effective marketing strategy and client centric approach have also assisted us in catering to the needs of a wide clientele in the market. As a result, our products have found a great demand in the market by several patrons across the nation. We offer products with the brand name of Downs and D-matrix. Our exporting country is Europe. Our latest infrastructure is one of the prime reasons for the premium quality levels we are able to maintain in our line of products, while our wide distribution network is functional in enabling timely delivery of the products. Having developed a well equipped manufacturing unit and an in-house design unit, we have been able to meet the specific requirements of our valued clients. Our sound infrastructure, flawless range, customization capabilities and timely delivery of consignment have earned us a huge clientele across the country. Our team comprises experienced professionals who use premium quality raw materials to fabricate a complete compliance matching up with the international quality standards. We possess the excellent example of providing highly efficient and quality products at affordable prices as per clients required quantities within the desired time frame. Under the profound leadership of the Sales Manager Mr. Darshan Kumar, who holds vast experience and domain expertise, this organization has been successfully carved a respectable niche in this industry. His business acumen, outstanding credential, and trustworthy commitments have been highly regarded by the clients. Being an authentic business organization, we are entrusted with the tag of reliable associates for Neuro Surgical Equipments. We are engaged in providing products with unblemished features, quality, and durability. Owing to our ethical business policies and transparent dealings, we have carved a unique niche for ourselves. We have the support of modern infrastructural setup which comprises manufacturing, quality testing, warehousing, and packaging unit. Our modern manufacturing unit is located on the outskirts of the city helping us in meeting the urgent requirements of the customers on time. Moreover, the unit is installed with advanced production machinery that allows us to successfully manufacture the products as per the needs and requirements of the customers. Further, our team of diligent personnel handles our unit with ease. They have deep market knowledge and expertise enabling us to manufacture precision engineered products that meet the demands of the industry. Team : We have a team which is full of individuals who have profound industry experience and exposure to the market. This hard working and efficient team works in absolute coordination to bring forth the best quality products.